Okay, so the 1960s were a weird time. I wasn't alive yet, but looking at the remnants of culture and society through its artifacts, you get a picture of both turbulence, effervescent joy, revolution, groovy designs on bright polyester, and really odd films, at times. Enter Hammer Film Productions, which brought its infamous brand of lurid horror and cinema to England and the rest of the world, via films like The Curse of Frankenstein, Twins of Evil, Countess Dracula, Dracula Has Risen From The Grave, and this film, The Witches, which I've never seen until now. 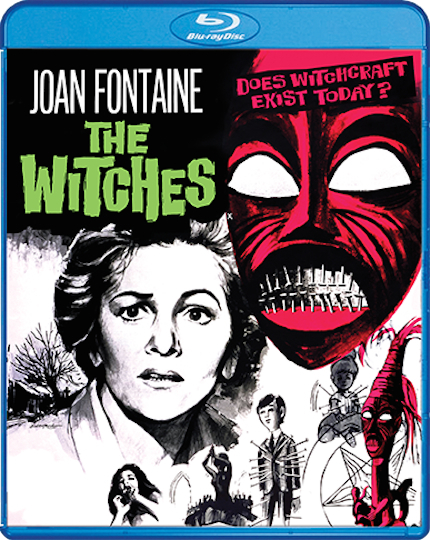 Starring Hollywood stalwart, Oscar winner, and sister of Olivia de Havilland, Joan Fontaine (Rebecca, Suspicion, Ivy), as teacher Gwen Mayfield, who is quite scarred by her experience working in Africa... at the hands of a witch doctor, or voodoo, or mass hysteria. Yeah, it was definitely an entirely different time and universe. Anyway, it doesn't take long before weird things start happenind, and then I think of the amazing Hot Fuzz from Edgar Wright, which pokes fun at tiny English villages and odd happenings like in The Witches. I wouldn't be surprised in the slightest if this film was an influence on that one. Okay, so weird things happen, red herrings abound, and yay --- the occult rears its ugly head. There's confusion, amnesia, gaslighting, and black magic --- along with a trippy dance number that I was a bit surprised to see white people in the 1960s take on, if I'm honest. The Witches isn't an amazing film, but it's fun to watch, and it looks and sounds awesome in this Scream Factory release. If you're a Hammer Horror fan, you'll want to pick this one up. Hell, watch it with a double feaure of The Plague of the Zombies for an awesome black magic Hammer double feature. The "Hammer Glamour" featurette on the ladies who starred in some of the studio's films is great fun; it features Caroline Munroe, Martine Beswick, Madeline Smith, and more. The Witches is a weird, nostalgic film that offers plenty of fun for those who like the occult, as well as Hammer Horror, of course. To find out more, watch a trailer, and order The Witches, head on over to Scream Factory's website here.